Aydat (unit) Gurim Is Having A Blast! On Thursday, the madrichim (counselors) planned a peulat erev (evening activity) for their tzrifim (bunks). 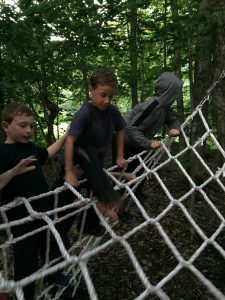 Some banim (boys) had an Erev Spy, where they found missing treasure while climbing on the low ropes course. 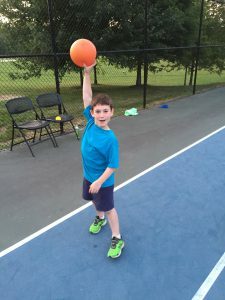 The others had a fantastic machanaim (dodgeball) tournament, where they dressed in team colors and duked it out for the title of dodgeball champion. One bunk of banot (girls) came together for an erev chaverim (friend night), where they uncovered bonds of friendship. The other tzrif found pet rocks and used their fantastic imaginations to give them all the things pets need like walks, food, and love. Friday evening and Shabbat day were very similar to last week, and the chanichim (campers) all enjoyed themselves, even if it was a bit rainy. The highlights of free time were gaga, newcomb, and tetherball. Today (Monday), we are preparing to have a fantastic July 4th celebration on July 6th, because July 4th was on Shabbat. There will be a parade, dancing, a talent show, and fireworks to cap off the night! We also look forward to a trip to Kingston State Park on our next achlah yom (cool day).